Alltel this week introduced the BlackBerry 8830 World Edition Smartphone to their BlackBerry offering. The BlackBerry 8830 World Edition is the first BlackBerry smartphone to combine technologies that allow it to connect to both CDMA and GSM/GPRS networks. The 8830 operates in the United States on Alltel's CDMA network and comes with an unlocked SIM card slot for international roaming on GSM/GPRS networks. August 30, Little Rock, AR - Alltel Wireless, America’s largest network, giving you coverage across the country, today announced the BlackBerry® 8830 World Edition smartphone will now be available to customers. Developed by Research In Motion (RIM) (Nasdaq: RIMM; TSX: RIM), the BlackBerry 8830 World Edition is the first BlackBerry smartphone to combine technologies that allow it to connect to both CDMA and GSM/GPRS networks. The sleek and stylish BlackBerry 8830 will satisfy the most demanding user needs. It is equipped with a full QWERTY keyboard as well as industry-leading e-mail and messaging capabilities. Additionally, the BlackBerry 8830 has an intuitive trackball navigation system, GPS capabilities with TeleNav GPS Navigator™ service and BlackBerry® Maps, and a microSD expandable memory slot. With an enhanced media player for music, pictures and videos, this is the first smartphone to include Alltel Jump Music capabilities. The BlackBerry 8830 from Alltel operates in the United States on Alltel’s CDMA network and comes with an unlocked SIM card slot for international roaming on GSM/GPRS networks. Alltel customers can also choose to arrange international voice and data support through WorldCell TravelComm, whose third-party SIM card solution makes it easy to talk internationally in over 160 countries and access BlackBerry data services in 78 countries. Accessories for BlackBerry handsets, including an automotive charger and Bluetooth® headsets, are available online at www.shopalltel.com and through retail outlets. Alltel (NYSE: AT) is owner and operator of the nation's largest wireless network and has over 12 million customers. 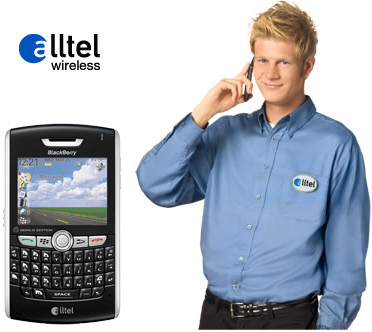 For more information about Alltel, please visit www.alltel.com. The BlackBerry and RIM families of related marks, images and symbols are the exclusive properties and trademarks of Research In Motion Limited. RIM, Research In Motion and BlackBerry are registered with the U.S. Patent and Trademark Office and may be pending or registered in other countries. All other brands, product names, company names, trademarks and service marks are the properties of their respective owners.